Through the vision and talent of noted sports artist Al Sorenson, Big Time Bats is proud to offer this truly unique hand-painted jerseys featuring the autograph of Boston Red Sox second baseman Dustin Pedroia. Pedroia made his debut for the Red Sox Aug. 22, 2006, and over the past 8 seasons has become a defensive stalwart and offensive leader. Pedroia was the 2008 AL MVP and part of the team's World Series Championships in 2007 and 2013. 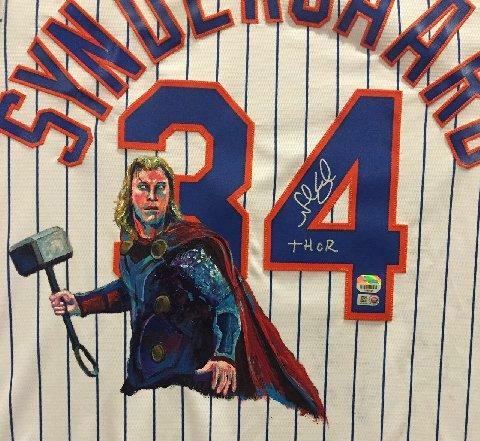 This jersey is an original piece of work by famed sports artist Al Sorenson that every Mets fan would love to have for their collection. Sorenson is widely respected for applying his talents to creating vivid renderings of popular sports stars on authentic uniform pieces, and this new release is no exception. 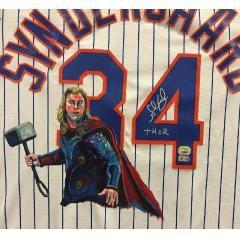 On the back of an authentic Noah Syndergaard NY Mets Jersey the artist created a special homage to the pitcher the fans called, "Thor." This is a one-of-a-kind pieced and fully authenticated by PSA/DNA.